Helicopter Reporter Jerry Ferguson (with help from Pilot Andrew Park took these unbelievable photos earlier this week while filming the weather for a local television station. No, it is not an A-bomb detonated over Phoenix. 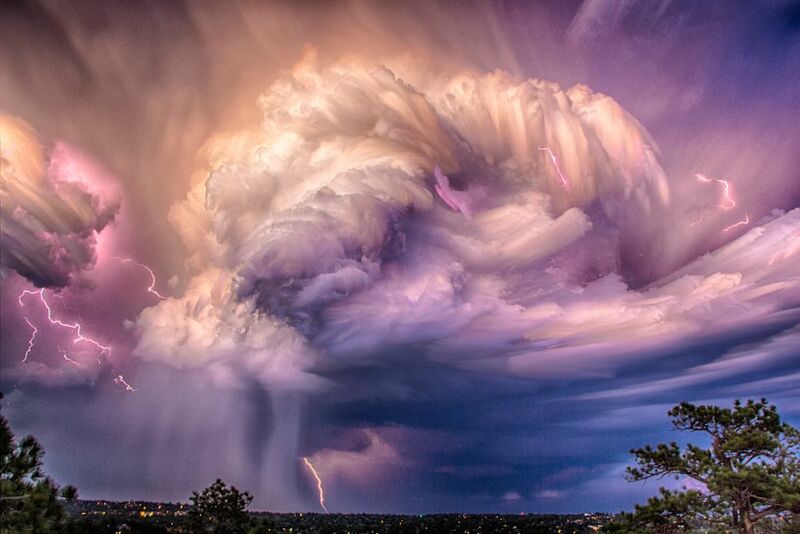 The photo depicts a dangerous weather phenomenon known as a microburst. Microbursts are small but powerful rushes of rain-cooled air that collapse toward the ground from a parent thunderstorm. They are basically like a tornado in reverse – while a tornado funnels wind in and up, a microburst’s wind is funneled down and out. Microbursts are created by the downdrafts found in strong thunderstorms and are triggered by two main physical processes — the drag that’s created by falling rain and hail, and evaporation. Once the downdraft hits the ground, the wind — with gusts up to 150 mph — spread out over the land in all directions. Below is a timelapse video of the same storm shot by Bryan Snider from the vantage point of Phoenix’s Sky Harbor International Airport. The rainshafts in this footage make it look like Mother Nature turned on a faucet. As an official member of the Cloud Appreciation Society, photos like these make me swoon. These shots are from Ecuador Airlines pilot Santiago Borja. The first was captured through a Boeing 767-300 cockpit window at 37,000 feet over the Pacific Ocean. The second was taken last October along the coast of Venezuela. In the Washington Post, Borja explained the obstacles he met when taking these types of photos. “Storms are tricky because the lightning is so fast, there is no tripod and there is a lot of reflection from inside lights,” he said. Turbulence and near darkness also added complications to the shot. View more of Borja’s travel and storm photos on Instagram. 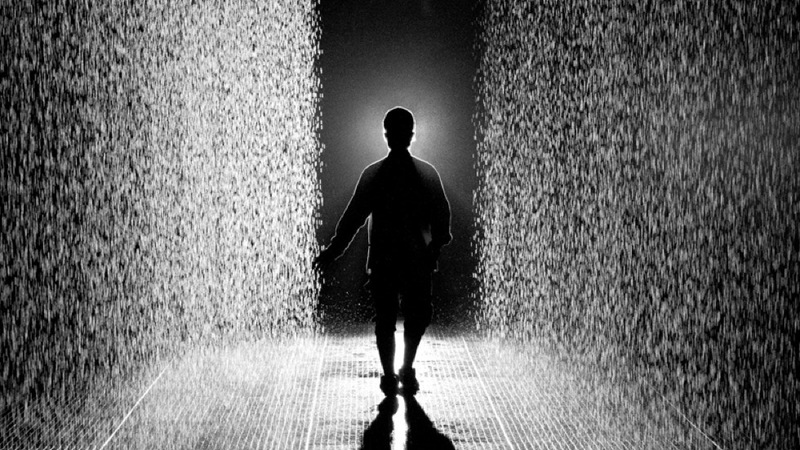 As you walk into the man-made rainfall 3D cameras pickup on your presence, location and movement. The Cameras then send instructions for the rain continue to fall close to people, yet not too close, as they intersect the space. 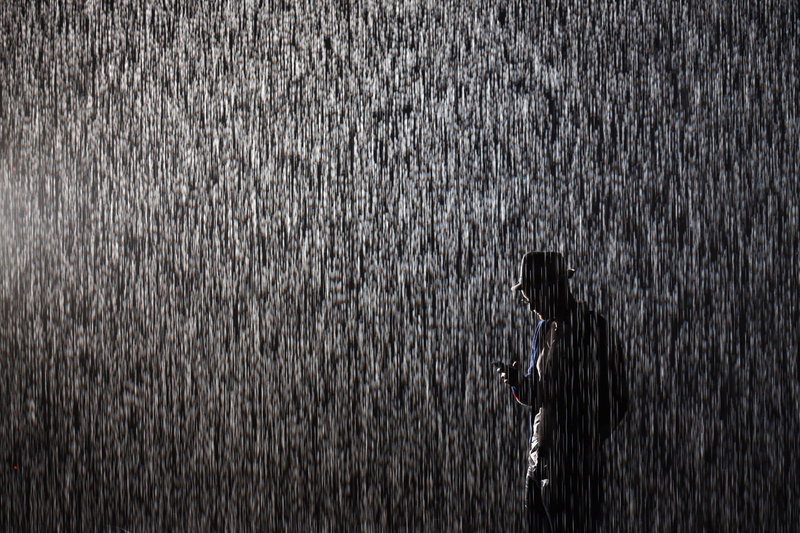 The fact that somebody created a gigantic indoor torrential downpour is cool. 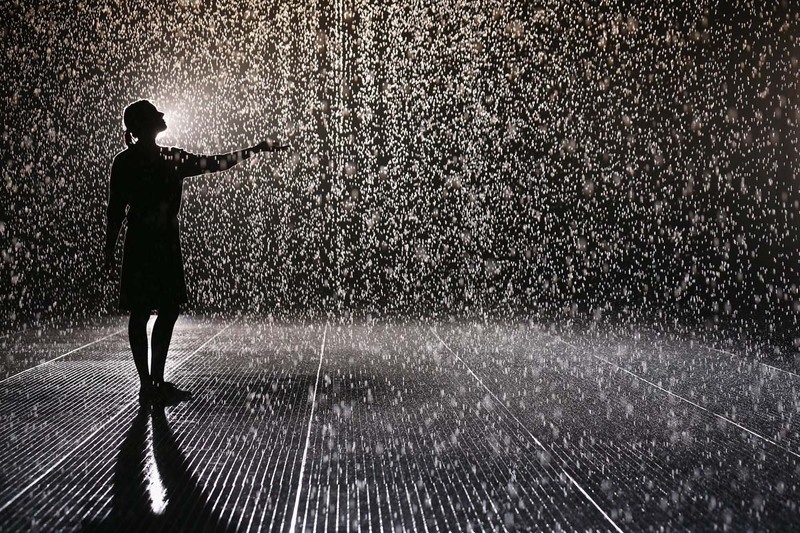 But the ability to walk through the deluge without getting the slightest bit wet is outstanding. The installation runs until March and doesn’t cost a penny (pence). I wish I were in London to see it. This is a photo taken from above a lightning storm over West Africa by André Kuipers during an extended stay aboard the International Space Station. 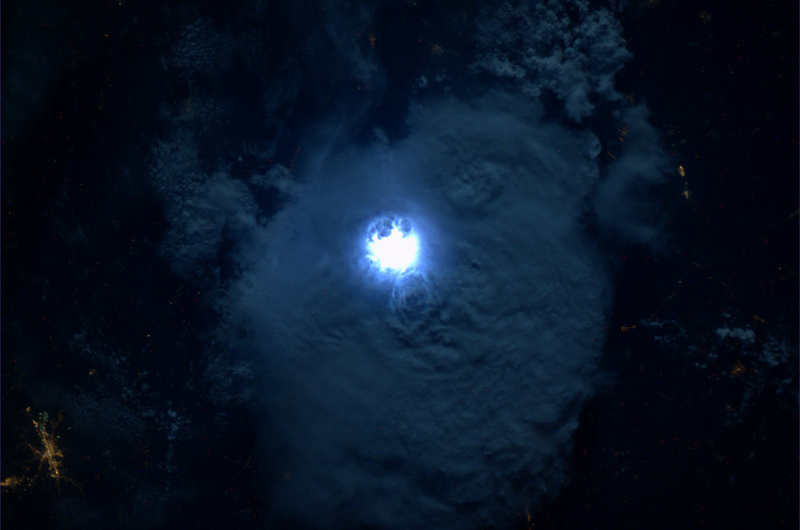 Lightning storms are a common sight for those on the space station. There are many millions of lightning flashes on Earth everyday. Considering that the ISS orbits Earth 16 times a day you can bet the IIS crew gets quite a show. It is the last day of Lightning Safety Awareness Weak. The photo above is an image sequence, by Chris Kotsiopoloulos, containing 70 lightning shots. 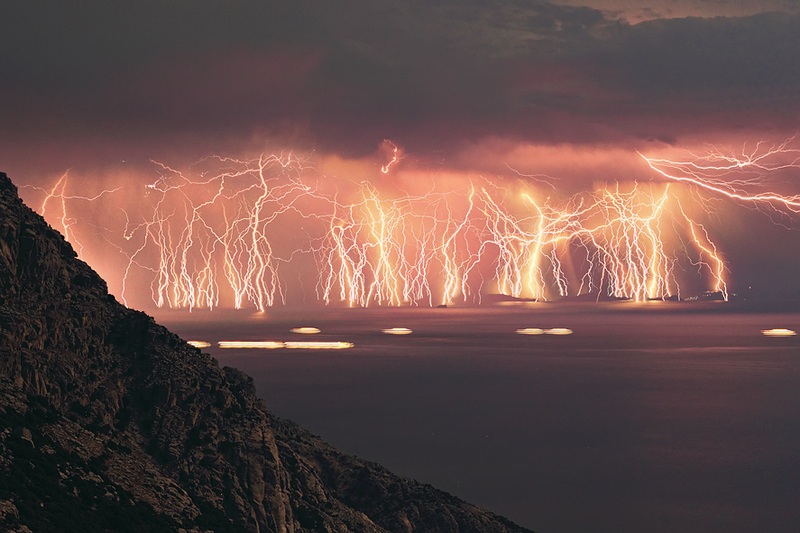 It was taken at Ikaria island during a severe thunderstorm. Fire in the sky! How lightning works is still pretty much a mystery. But this summer, some large steps to understanding it’s movement were made. Until recently, there wasn’t fast enough camera technology to capture an x-ray image of lightning. A new camera has a resolution sharp enough to reveal a bright ball of x-rays at the head of the bolt, with almost no lingering radiation along the bolt’s trail. 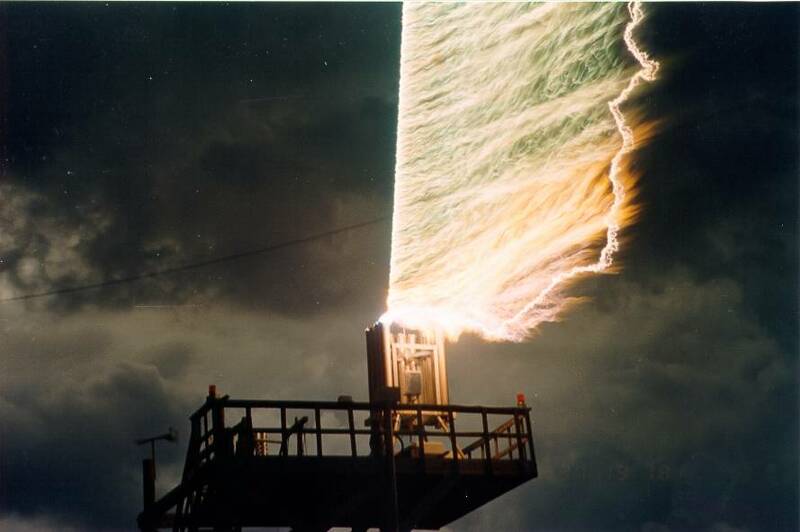 The X-ray glow follows a so-called lightning leader – a channel in the air that forms a path for the lightning. The leader’s charged tip creates an electric field that accelerates electrons almost to the speed of light and causes the X-ray emissions. The lightning leader is also known as a step leader, because it seems to travel by leaps and bounds rather than in a continuous line. The trail left by the step leader allows negative charge to travel down, even as positively charged leaders travel upward from the ground to meet in the middle. That triggers a so-called return stroke moving upward from the ground toward the cloud – the flash of what human eyes see as lightning. You can find a lot more lightning stuff on Artifacting.